The oldest surviving panel icon of Christ Pantocrator, encaustic on panel, c. 6th century, showing the appearance of Jesus that is still immediately recognised today. The depiction of Jesus in pictorial form was controversial in the early Church. The depiction of him in art took several centuries to reach a conventional standardized form for his physical appearance, which has subsequently remained largely stable since that time. Most images of Jesus have in common a number of traits which are now almost universally associated with Jesus, although variants are seen. Incised sarcophagus slab with the Adoration of the Magi from the Catacombs of Rome, 3rd century. Plaster cast with added colour. No physical description of Jesus is contained in any of the canonical Gospels, except in Revelation 1:14,15 (KJV 1611 Translation)- His head and his hairs were white like wool, white as snow, and his eyes were as a flame of fire, and his feet like unto fine brass as if they burned in a furnace. In the Acts of the Apostles, Jesus is said to have manifested as a "light from heaven" that temporarily blinded the Apostle Paul. The Book of Revelation makes a reference to a vision the author had of Jesus: "among the lampstands was someone like a Son of Man, dressed in a robe reaching down to his feet and with a golden sash around his chest. His hair was like wool, and his eyes were like blazing fire. His feet were like bronze glowing in a furnace, and his voice was like the sound of rushing waters. In his right hand he held seven stars, and out of his mouth came a sharp double-edged sword. His face was like the sun shining in all its brilliance." (Revelation 1:12–16, NIV). Use in art of the Revelation description of Jesus has generally been restricted to illustrations of the book itself. Jesus in the Catacombs of Rome. 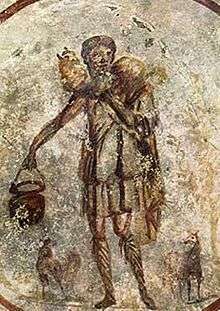 3rd-century fresco from the Catacomb of Callixtus of Christ as the Good Shepherd with a rooster on his right. Exodus 20:4-6 "Thou shalt not make unto thee any graven image" is one of the Ten Commandments and except for minor exceptions made Jewish depictions of first century individuals a scarcity. But attitudes towards the interpretation of this Commandment changed through the centuries, in that while first century Rabbis in Judea objected violently to the depiction of human figures and placement of statues in Temples, third century Babylonian Jews had different views; and while no figural art from first century Roman Judea exists, the art on the Dura synagogue walls developed with no objection from the Rabbis early in the third century. During the persecution of Christians under the Roman Empire, Christian art was necessarily furtive and ambiguous, and there was hostility to idols in a group still with a large component of members with Jewish origins, surrounded by, and polemicising against, sophisticated pagan images of gods. Irenaeus (d. c.202), Clement of Alexandria (d. 215), Lactantius (ca. 240 – ca. 320) and Eusebius of Caesarea (d. ca. 339) disapproved of portrayals in images of Jesus. The 36th canon of the non-ecumenical Synod of Elvira in 306 AD reads, 'It has been decreed that no pictures be had in the churches, and that which is worshipped or adored be not painted on the walls', which has been interpreted by Calvin and other Protestants as an interdiction of the making of images of Christ. The issue remained the subject of controversy until the end of the 4th century. Initially Jesus was represented indirectly by pictogram symbols such as the Ichthys (fish), the peacock, or an anchor (the Labarum or Chi-Rho was a later development). The staurogram seems to have been a very early representation of the crucified Jesus within the sacred texts. Later personified symbols were used, including Jonah, whose three days in the belly of the whale pre-figured the interval between Christ's death and Resurrection; Daniel in the lion's den; or Orpheus charming the animals. The image of "The Good Shepherd", a beardless youth in pastoral scenes collecting sheep, was the most common of these images, and was probably not understood as a portrait of the historical Jesus at this period. It continues the classical Kriophoros ("ram-bearer" figure), and in some cases may also represent the Shepherd of Hermas, a popular Christian literary work of the 2nd century. The appearance of Jesus had some theological implications. While some Christians thought Jesus should have the beautiful appearance of a young classical hero, and the Gnostics tended to think he could change his appearance at will, for which they cited the Meeting at Emmaus as evidence, others including the Church Fathers Justin (d.165) and Tertullian (d.220) believed, following Isaiah:53:2, that Christ's appearance was unremarkable: "he had no form nor comeliness, that we should look upon him, nor beauty that we should delight in him." But when the pagan Celsus ridiculed the Christian religion for having an ugly God in about 180, Origen (d. 248) cited Psalm 45:3: "Gird thy sword upon thy thigh, mighty one, with thy beauty and fairness" Later the emphasis of leading Christian thinkers changed; Jerome (d.420) and Augustine of Hippo (d. 430) argued that Jesus must have been ideally beautiful in face and body. For Augustine he was "beautiful as a child, beautiful on earth, beautiful in heaven." Bearded Jesus between Peter and Paul, Catacombs of Marcellinus and Peter, Rome. Second half of the 4th century. Such works "first present us with the fully formed image of Christ in Majesty that will so dominate Byzantine art" For detail of Christ, see This File. From the 3rd century onwards, the first narrative scenes from the Life of Christ to be clearly seen are the Baptism of Christ, painted in a catacomb in about 200, and the miracle of the Raising of Lazarus, both of which can be clearly identified by the inclusion of the dove of the Holy Spirit in Baptisms, and the vertical, shroud-wrapped body of Lazarus. Other scenes remain ambiguous – an agape feast may be intended as a Last Supper, but before the development of a recognised physical appearance for Christ, and attributes such as the halo, it is impossible to tell, as tituli or captions are rarely used. 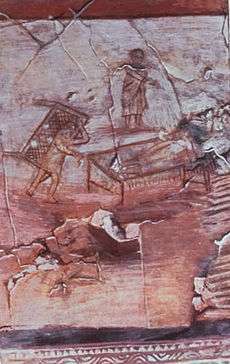 There are some surviving scenes from Christ's Works of about 235 from the Dura Europos church on the Persian frontier of the Empire. During the 4th century a much greater number of scenes came to be depicted, usually showing Christ as youthful, beardless and with short hair that does not reach his shoulders, although there is considerable variation. Jesus is sometimes shown performing miracles by means of a wand, as on the doors of Santa Sabina in Rome (430–32). He uses the wand to change water to wine, multiply the bread and fishes, and raise Lazarus. When pictured healing, he only lays on hands. The wand is thought to be a symbol of power. The bare-faced youth with the wand may indicate that Jesus was thought of as a user of magic or wonder worker by some of the early Christians. No art has been found picturing Jesus with a wand before the 2nd century. Some scholars suggest that the Gospel of Mark, the Secret Gospel of Mark and the Gospel of John (the so-called Signs Gospel), portray such a wonder worker, user of magic, a magician or a Divine man. Only the Apostle Peter is also depicted in ancient art with a wand. 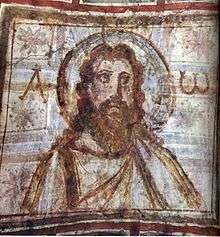 Another depiction, seen from the late 3rd century or early 4th century onwards, showed Jesus with a beard, and within a few decades can be very close to the conventional type that later emerged. This depiction has been said to draw variously on Imperial imagery, the type of the classical philosopher, and that of Zeus, leader of the Greek gods, or Jupiter, his Roman equivalent, and the protector of Rome. According to art historian Paul Zanker, the bearded type has long hair from the start, and a relatively long beard (contrasting with the short "classical" beard and hair always given to St Peter, and most other apostles); this depiction is specifically associated with "Charismatic" philosophers like Euphrates the Stoic, Dio of Prusa and Apollonius of Tyana, some of whom were claimed to perform miracles. After the very earliest examples of c. 300, this depiction is mostly used for hieratic images of Jesus, and scenes from his life are more likely to use a beardless, youthful type. The tendency of older scholars such as Talbot Rice to see the beardless Jesus as associated with a "classical" artistic style and the bearded one as representing an "Eastern" one drawing from ancient Syria, Mesopotamia and Persia seems impossible to sustain, and does not feature in more recent analyses. Equally attempts to relate on a consistent basis the explanation for the type chosen in a particular work to the differing theological views of the time have been unsuccessful. From the 3rd century on, some Christian leaders, such as Clement of Alexandria had recommended the wearing of beards by Christian men. The centre parting was also seen from early on, and was also associated with long-haired philosophers. From the middle of the 4th century, after Christianity was legalized by the Edict of Milan in 313, and gained Imperial favour, there was a new range of images of Christ the King, using either of the two physical types described above, but adopting the costume and often the poses of Imperial iconography. These developed into the various forms of Christ in Majesty. Some scholars reject the connection between the political events and developments in iconography, seeing the change as a purely theological one, resulting from the shift of the concept and title of Pantocrator ("Ruler of all") from God the Father (still not portrayed in art) to Christ, which was a development of the same period, perhaps led by Athanasius of Alexandria (d. 373). Another depiction drew from classical images of philosophers, often shown as a youthful "intellectual wunderkind" in Roman sarcophagii; the Traditio Legis image initially uses this type. Gradually Jesus became shown as older, and during the 5th century the image with a beard and long hair, now with a cruciform halo, came to dominate, especially in the Eastern Empire. In the earliest large New Testament mosaic cycle, in Sant'Apollinare Nuovo, Ravenna (ca. 520), Jesus is beardless though the period of his ministry until the scenes of the Passion, after which he is shown with a beard. 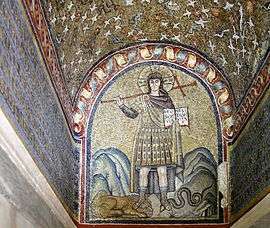 The Good Shepherd, now clearly identified as Christ, with halo and often rich robes, is still depicted, as on the apse mosaic in the church of Santi Cosma e Damiano in Rome, where the twelve apostles are depicted as twelve sheep below the imperial Jesus, or in the Mausoleum of Galla Placidia at Ravenna. Once the bearded, long-haired Jesus became the conventional representation of Jesus, his facial features slowly began to be standardised, although this process took until at least the 6th century in the Eastern Church, and much longer in the West, where clean-shaven Jesuses are common until the 12th century, despite the influence of Byzantine art. But by the late Middle Ages the beard became almost universal and when Michelangelo showed a clean-shaven Apollo-like Christ in his Last Judgment fresco in the Sistine Chapel (1534–41) he came under persistent attack in the Counter-Reformation climate of Rome for this, as well as other things. 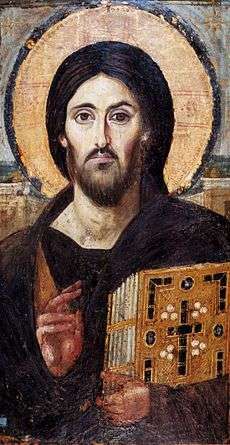 French scholar Paul Vignon has listed fifteen similarities ("marks", like tilaka) between most of the icons of Jesus after this point, particularly in the icons of "Christ Pantocrator" ("The all-powerful Messiah"). He claims that these are due to the availability of the Image of Edessa (which he claims to be identical to the Shroud of Turin, via Constantinople) to the artists. Certainly images believed to have miraculous origins, or the Hodegetria, believed to be a portrait of Mary from the life by Saint Luke, were widely regarded as authoritative by the Early Medieval period and greatly influenced depictions. In Eastern Orthodoxy the form of images was, and largely is, regarded as revealed truth, with a status almost equal to scripture, and the aim of artists is to copy earlier images without originality, although the style and content of images does in fact change slightly over time. As to the historical appearance of Jesus, in one possible translation of the apostle Paul's First Epistle to the Corinthians, Paul urges Christian men of first-century Corinth not to have long hair. An early commentary by Pelagius (ca. AD 354 – ca. AD 420/440) says, "Paul was complaining because men were fussing about their hair and women were flaunting their locks in church. Not only was this dishonoring to them, but it was also an incitement to fornication." Some have speculated that Paul was a Nazirite who kept his hair long even though such speculation is at odds with Paul's statement in I Corinthians 11:14 that long hair for men was shameful at the time. Jesus was a practicing Jew so presumably had a beard. By the 5th century depictions of the Passion began to appear, perhaps reflecting a change in the theological focus of the early Church. The 6th century Rabbula Gospels includes some of the earliest surviving images of the crucifixion and resurrection. By the 6th century the bearded depiction of Jesus had become standard in the East, though the West, especially in northern Europe, continued to mix bearded and unbearded depictions for several centuries. The depiction with a longish face, long straight brown hair parted in the middle, and almond shaped eyes shows consistency from the 6th century to the present. Various legends developed which were believed to authenticate the historical accuracy of the standard depiction, such as the image of Edessa and later the Veil of Veronica. Partly to aid recognition of the scenes, narrative depictions of the Life of Christ focused increasingly on the events celebrated in the major feasts of the church calendar, and the events of the Passion, neglecting the miracles and other events of Jesus' public ministry, except for the raising of Lazarus, where the mummy-like wrapped body was shown standing upright, giving an unmistakable visual signature. A cruciform halo was worn only by Jesus (and the other persons of the Trinity), while plain halos distinguished Mary, the Apostles and other saints, helping the viewer to read increasingly populated scenes. The period of Byzantine Iconoclasm acted as a barrier to developments in the East, but by the 9th century art was permitted again. The Transfiguration of Jesus was a major theme in the East and every Eastern Orthodox monk who had trained in icon painting had to prove his craft by painting an icon of the Transfiguration. However, while Western depictions increasingly aimed at realism, in Eastern icons a low regard for perspective and alterations in the size and proportion of an image aim to reach beyond earthly reality to a spitual meaning. The 13th century witnessed a turning point in the portrayal of the powerful Kyrios image of Jesus as a wonder worker in the West, as the Franciscans began to emphasize the humility of Jesus both at his birth and his death via the nativity scene as well as the crucifixion. The Franciscans approached both ends of this spectrum of emotions and as the joys of the Nativity of were added to the agony of crucifixion a whole new range of emotions were ushered in, with wide ranging cultural impact on the image of Jesus for centuries thereafter. The Renaissance brought forth a number of artists who focused on the depictions of Jesus and after Giotto, Fra Angelico and others systematically developed uncluttered images that focused on the depiction of Jesus with an ideal human beauty, in works like Leonardo da Vinci's Last Supper, arguably the first High Renaissance painting. 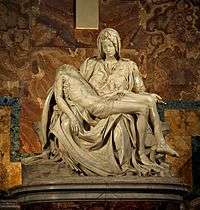 Images of Jesus now drew on classical sculpture, at least in some of their poses. However Michelangelo was considered to have gone much too far in his beardless Christ in his The Last Judgment fresco in the Sistine Chapel, which very clearly adapted classical sculptures of Apollo, and this path was rarely followed by other artists. The High Renaissance was contemporary with the start of the Protestant Reformation which, especially in its first decades, violently objected to almost all public religious images as idolaterous, and vast numbers were destroyed. Gradually images of Jesus became acceptable to most Protestants in various contexts, especially in narrative contexts, as book illustrations and prints, and later in larger paintings. Protestant art continued the now-standard depiction of the physical appearance of Jesus. Meanwhile, the Catholic Counter-Reformation re-affirmed the importance of art in assisting the devotions of the faithful, and encouraged the production of new images of or including Jesus in enormous numbers, also continuing to use the standard depiction. By the end of the 19th century, new reports of miraculous images of Jesus had appeared and continue to receive significant attention, e.g. Secondo Pia's 1898 photograph of the Shroud of Turin, one of the most controversial artifacts in history, which during its May 2010 exposition it was visited by over 2 million people. Another 20th century depiction of Jesus, namely the Divine Mercy image based on Faustina Kowalska's reported vision has over 100 million followers. The first cinematic portrayal of Jesus was in the 1897 film La Passion du Christ produced in Paris, which lasted 5 minutes. Thereafter cinematic portrayals have continued to show Jesus with a beard in the standard western depiction that resembles traditional images. Engraving of a crucified donkey believed to be an early anti-Christian graffito, it reads: "Alexamenos worships [his] god." 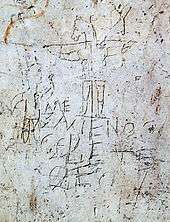 A very early image which is believed to be an early anti-Christian graffito is the Alexamenos graffito, a unique piece of wall graffiti near the Palatine hill in Rome. The inscription has been ascribed dates ranging from the 1st to the 3rd centuries AD. It was apparently drawn by a Roman soldier to mock another soldier who was a Christian. The caption reads, in Greek, "Alexamenos worships [his] God", while the image shows a man raising his hand toward a crucified figure with a donkey's head. This seems to refer to a Roman misconception that the Jews worshipped a god with the form of a donkey, so that the image would be at once antisemitic and anti-Christian. A small minority of scholars dispute whether this image depicts Jesus, proposing that this image may be a reference to another deity. Certain local traditions have maintained different depictions, sometimes reflecting local racial characteristics, as do the Catholic and Orthodox depictions. The Coptic Church of Egypt separated in the 5th century, and has a distinctive depiction of Jesus, consistent with Coptic art. The Ethiopian Church, also Coptic, developed on Coptic traditions, but shows Jesus and all Biblical figures with the Ethiopian appearance of its members. Other traditions in Asia and elsewhere also show the race of Jesus as that of the local population (see Chinese picture in the gallery below). In modern times such variation has become more common, but images following the traditional depiction in both physical appearance and clothing are still dominant, perhaps surprisingly so. In Europe, local ethnic tendencies in depictions of Jesus can be seen, for example in Spanish, German, or Early Netherlandish painting, but almost always surrounding figures are still more strongly characterised. For example, the Virgin Mary, after the vision reported by Bridget of Sweden, was often shown with blonde hair, but Christ's is very rarely paler than a light brown. Some medieval Western depictions, usually of the Meeting at Emmaus, where his disciples do not recognise him at first (Luke.24.13–32), showed Jesus wearing a Jewish hat. 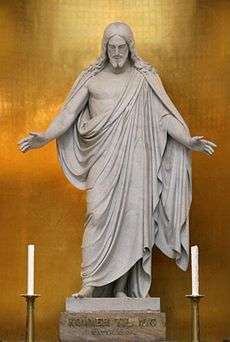 The CGI model created in 2001 depicted Jesus' skin color as being darker and more olive-colored than his traditional depictions in Western art. In 2001, the television series Son of God used one of three first-century Jewish skulls from a leading department of forensic science in Israel to depict Jesus in a new way. A face was constructed using forensic anthropology by Richard Neave, a retired medical artist from the Unit of Art in Medicine at the University of Manchester. The face that Neave constructed suggested that Jesus would have had a broad face and large nose, and differed significantly from the traditional depictions of Jesus in renaissance art. Additional information about Jesus' skin color and hair was provided by Mark Goodacre, a New Testament scholar and professor at Duke University. Using third-century images from a synagogue—the earliest pictures of Jewish people—Goodacre proposed that Jesus' skin color would have been darker and swarthier than his traditional Western image. He also suggested that he would have had short, curly hair and a short cropped beard. This is also confirmed in the First Epistle to the Corinthians, where Paul the Apostle states that it is "disgraceful" for a man to have long hair. As Paul knew many of the disciples and members of Jesus' family, it is unlikely that he would have written such a thing had Jesus had long hair. 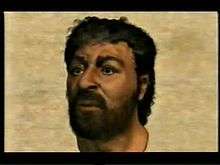 Although not literally the face of Jesus, the result of the study determined that Jesus' skin would have been more olive-colored than white, and that he would have looked like a typical Galilean Semite. Among the points made was that the Bible records that Jesus's disciple Judas had to point him out to those arresting him in Gethsemane. The implied argument is that if Jesus's physical appearance had differed markedly from his disciples, then he would have been relatively easy to identify. Secondo Pia's negative of his photo of the Shroud of Turin. Many Christians believe this image to be the Holy Face of Jesus. 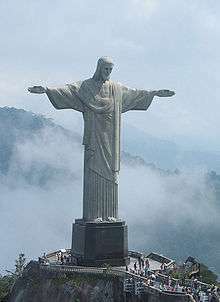 There are, however, some images which have been claimed to realistically show how Jesus looked. One early tradition, recorded by Eusebius of Caesarea, says that Jesus once washed his face with water and then dried it with a cloth, leaving an image of his face imprinted on the cloth. This was sent by him to King Abgarus of Edessa, who had sent a messenger asking Jesus to come and heal him of his disease. This image, called the Mandylion or Image of Edessa, appears in history in around 525. Numerous replicas of this "image not made by human hands" remain in circulation. There are also icon compositions of Jesus and Mary that are traditionally believed by many Orthodox to have originated in paintings by Luke the Evangelist. A currently familiar depiction is that on the Shroud of Turin, whose records go back to 1353. Controversy surrounds the shroud and its exact origin remains subject to debate. The Shroud of Turin is respected by Christians of several traditions, including Baptists, Catholics, Lutherans, Methodists, Orthodox, Pentecostals, and Presbyterians. It is one of the Catholic devotions approved by the Holy See, that to the Holy Face of Jesus, now uses the image of the face on the shroud as it appeared in the negative of the photograph taken by amateur photographer Secondo Pia in 1898. The image cannot be clearly seen on the shroud itself with the naked eye, and it surprised Pia to the extent that he said he almost dropped and broke the photographic plate when he first saw the developed negative image on it in the evening of 28 May 1898. Before 1898, devotion to the Holy Face of Jesus used an image based on the Veil of Veronica, where legend recounts that Veronica from Jerusalem encountered Jesus along the Via Dolorosa on the way to Calvary. When she paused to wipe the sweat from Jesus's face with her veil, the image was imprinted on the cloth. The establishment of these images as Catholic devotions traces back to Sister Marie of St Peter and the Venerable Leo Dupont who started and promoted them from 1844 to 1874 in Tours France, and Sister Maria Pierina De Micheli who associated the image from the Shroud of Turin with the devotion in 1936 in Milan Italy. A very popular 20th century depiction among Roman Catholics and Anglicans is the Divine Mercy image, which was approved by Pope John Paul II in April 2000. The Divine Mercy depiction is formally used in celebrations of Divine Mercy Sunday and is venerated by over 100 million Catholics who follow the devotion. The image is not part of Acheiropoieta in that it has been depicted by modern artists, but the pattern of the image is said to have been miraculously shown to Saint Faustina Kowalska in a vision of Jesus in 1931 in Płock, Poland. Faustina wrote in her diary that Jesus appeared to her and asked her to "Paint an image according to the pattern you see". Faustina eventually found an artist (Eugene Kazimierowski) to depict the Divine Mercy image of Jesus with his right hand raised in a sign of blessing and the left hand touching the garment near his breast, with two large rays, one red, the other white emanating from near his heart. After Faustina's death, a number of other artists painted the image, with the depiction by Adolf Hyla being among the most reproduced. Warner Sallman stated that The Head of Christ was the result of a "miraculous vision that he received late one night", proclaiming that "the answer came at 2 A.M., January 1924" as "a vision in response to my prayer to God in a despairing situation." The Head of Christ is venerated in the Coptic Orthodox Church, after twelve-year-old Isaac Ayoub, who diagnosed with cancer, saw the eyes of Jesus in the painting shedding tears; Fr. Ishaq Soliman of St. Mark's Coptic Church in Houston, on the same day, "testified to the miracles" and on the next day, "Dr. Atef Rizkalla, the family physician, examined the youth and certified that there were no traces of leukemia". With episcopal approval from Bishop Tadros of Port Said and Bishop Yuhanna of Cairo, "Sallman's Head of Christ was exhibited in the Coptic Church", with "more than fifty thousand people" visiting the church to see it. 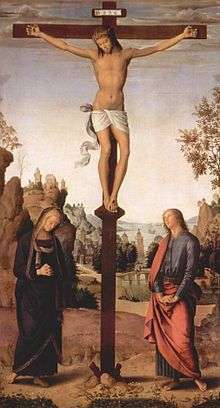 In addition, several religious magazines have explained the "power of Sallman's picture" by documenting occurrences such as headhunters letting go of a businessman and fleeing after seeing the image, a "thief who aborted his misdeed when he saw the Head of Christ on a living room wall", and deathbed conversions of non-believers to Christianity. As an extraordinarily successful work of Christian popular devotional art, it had been reproduced over half a billion times worldwide by the end of the 20th century. Christ Pantocrator mosaic in the dome above the Katholikon of the Church of the Holy Sepulchre in Jerusalem. 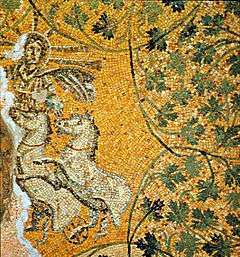 A representation of Jesus as the sun-god Helios/Sol Invictus riding in his chariot. Mosaic of the 3rd century on the Vatican grottoes under St. Peter's Basilica. Mural painting from the catacomb of Commodilla. 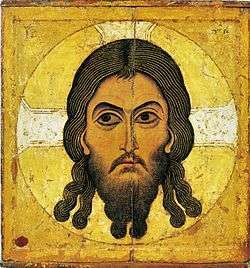 One of the first bearded images of Jesus, late 4th century. Jesus depicted on an early 8th-century Byzantine coin. After the Byzantine iconoclasm all coins had Christ on them. 11th-century Christ Pantocrator with the halo in a cross form, used throughout the Middle Ages. Characteristically, he is portrayed as similar in features and skin tone to the culture of the artist. 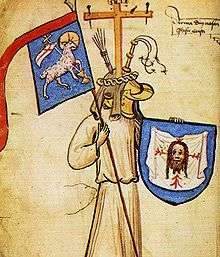 Christ in majesty, still with no beard, from an English 12th century illuminated manuscript. 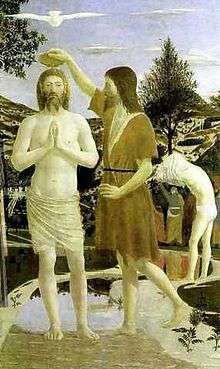 The Baptism of Christ, by Piero della Francesca, 1449. A traditional Ethiopian depiction of Jesus and Mary with distinctively "Ethiopian" features. 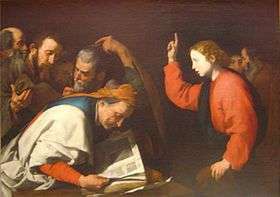 Jesus, aged 12, in discussion with scholars at the Temple, by José Ribera. A Chinese depiction of Jesus and the rich man, from Mark chapter 10. 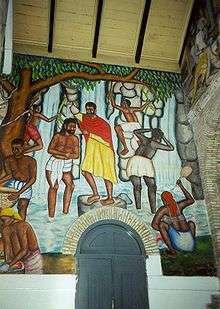 A mural depicting the baptism of Jesus in a typical Haitian rural scenery, Cathédrale de Sainte Trinité, Port-au-Prince, Haiti. Touchdown Jesus on the side of Hesburgh Library. 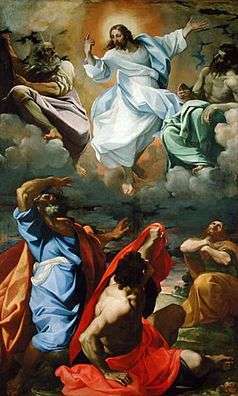 Transfiguration of Jesus depicting him with Elijah, Moses and three apostles by Carracci, 1594. 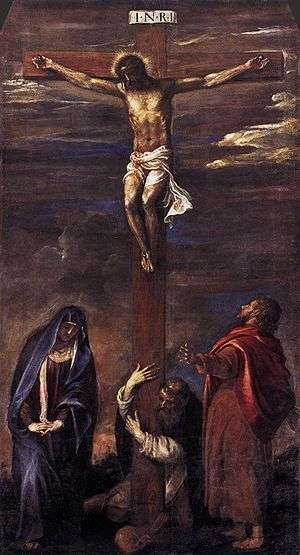 The Crucifixion of Christ, painted by Titian. 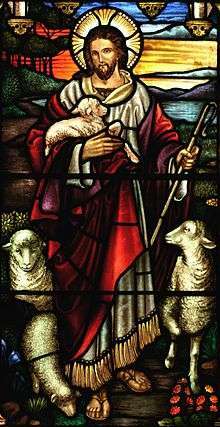 Jesus as Good Shepherd (stained glass at St John's Ashfield. Trevisani's depiction of the typical baptismal scene with the sky opening and the Holy Spirit descending as a dove, 1723. 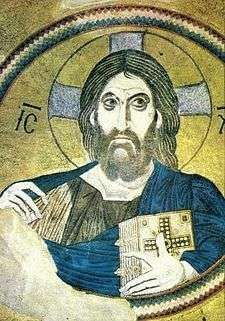 Jesus Christ Pantocrator – ancient mosaic from Hagia Sophia. 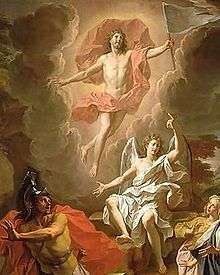 Resurrection by Noel Coypel, 1700, using a hovering depiction of Jesus. 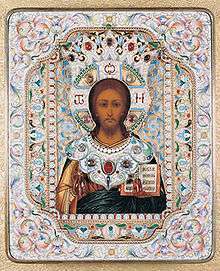 19th-century Russian icon of Christ Pantocrator. Head of Jesus (1890) by Enrique Simonet. "Christ All Mercy" Eastern Orthodox icon. ↑ John Calvin Institutes of the Christian Religion Book 1, Chapter V. Section 6. ↑ Hellemo, pp. 3–6, and Cartlidge and Elliott, 61 (Eusebius quotation) and passim. Clement approved the use of symbolic pictograms. ↑ McKay, John; Hill, Bennett (2011). A History of World Societies, Combined Volume (9 ed.). United States of America: Macmillan. p. 166. ISBN 978-0-312-66691-0. Retrieved 5 August 2013. ↑ Cartlidge and Elliott, 53 – this is Psalm 44 in the Latin Vulgate; English bible translations prefer "glory" and "majesty"
↑ Schiller, I 132. The image comes from the crypt of Lucina in the Catacombs_of_San_Callisto. There are a number of other 3rd century images. ↑ "CATHOLIC ENCYCLOPEDIA: Portraits of the Apostles". Retrieved 10 August 2008. ↑ Cartlidge and Elliott, 56–57. 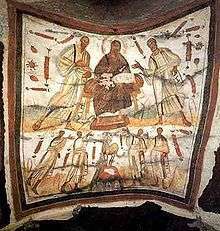 St Paul often has a long beard, but short hair, as in the catacomb fresco illustrated. St John the Baptist also often has long hair and a beard, and often retains in later art the thick shaggy or wavy long hair seen on some of the earliest depictions of Jesus, and in images of philosophers of the Charismatic type. ↑ Zanker,p. 299, note 48, and 300. . See also Cartlidge and Elliott, 55–61. ↑ Hellemo, 7–14, citing K. Berger in particular. ↑ Zanker, 299. Zanker has a full account of the development of the image of Christ at pp 289–307. ↑ The Shroud of Christ ("Constantinople") by Paul Vignon, Paul Tice, op. cit. ↑ "Zenit, May 5, 2010". Zenit.org. 5 May 2010. Retrieved 4 November 2011. ↑ Wells, Matt (27 March 2001). "Is this the real face of Jesus Christ?". The Guardian. London: Guardian. ISSN 0261-3077. OCLC 60623878. Retrieved 12 May 2011. 1 2 Legon, Jeordan (25 December 2002). "From science and computers, a new face of Jesus". CNN. Retrieved 12 May 2011. 1 2 3 Wilson, Giles (27 October 2004). "So what color was Jesus?". London: BBC News. Retrieved 12 May 2011. 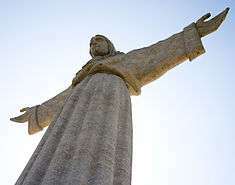 ↑ "Experts Reconstruct Face Of Jesus". London: CBS. 27 March 2001. Retrieved 12 May 2011. 1 2 3 Fillon, Mike (7 December 2002). "The Real Face Of Jesus". Popular Mechanics. San Francisco: Hearst. ISSN 0032-4558. OCLC 3643271. Retrieved 12 May 2011. ↑ Brockman, Norbert (13 September 2011). Encyclopedia of Sacred Places. ABC-CLIO. p. 140. ISBN 9781598846546. ↑ Morgan, David (1996). Icons of American Protestantism: The Art of Warner Sallman. Yale University Press. p. 62. ISBN 9780300063424. Sallman always insisted that his initial sketch of Jesus was the result of spiritual "picturization," a miraculous vision that he received late one night. "The answer came at 2 A.M., January 1924," he wrote. "It came as a vision in response to my prayer to God in a despairing situation." The situation was a deadline: Sallman had been commissioned to paint the February cover for the Covenant Companion, the monthly magazine of the Evangelical Covenant Church, and he had artist's block for weeks. The February issue was focusing on Christian youth, and Sallman's assignment was to provide an inspirational image of Christ that would "challenge our young people." "I mused over it for a long time in prayer and meditation," Sallman recalled, "seeking for something which would catch the eye and convey the message of the Christian gospel on the cover." ↑ Otto F.A. Meinardus, Ph.D. (Fall 1997). "Theological Issues of the Coptic Orthodox Inculturation in Western Society". Coptic Church Review. 18 (3). ISSN 0273-3269. An interesting case of inculturation occurred on Monday, November 11, 1991 when the 12-year-old Isaac Ayoub of Houston, Texas, suffering from leukemia, saw that the eyes of Jesus in the famous Sallman “Head of Christ” began moving and shedding an oily liquid like tears. On the same day, Fr. Ishaq Soliman, the Coptic priest of St. Mark’s Coptic Church in Houston, testified to the miracles. On the following day, Dr. Atef Rizkalla, the family physician, examined the youth and certified that there were no traces of leukemia. 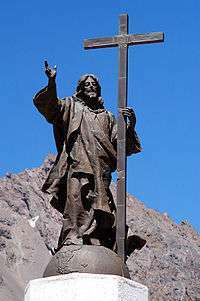 Sallman’s “Head of Christ” was exhibited in the Coptic Church and more than 50,000 people visited the church. Two Coptic bishops, Anbâ Tadros of Port Said and Anbâ Yuhanna of Cairo verified the story. 1 2 Meinardus, Otto F. A. (17 October 2006). Christians In Egypt: Orthodox, Catholic, and Protestant Communities - Past and Present. American University in Cairo Press. p. 70. ISBN 9781617972621. An interesting case of inculturation took place on Monday, November 11, 1991 when the twelve-year-old Isaac Ayoub of Houston, Texas, suffering from leukemia, saw that the eyes of Jesus in the famous Sallman "Head of Christ" began moving and shedding an oily liquid like tears. On the same day, Father Ishaq Soliman, the Coptic priest of St. Mark's Coptic Church in Houston, testified to the miracles. On the following day, Dr. Atef Rizkalla, the family physician, examined the youth and certified that there were no traces of leukemia. Sallman's "Head of Christ" was exhibited in the Coptic Church and more than fifty thousand people visited the church. Two Coptic bishops, Bishop Tadros of Port Said and Bishop Yuhanna of Cairo, verified the story. ↑ Morgan, David (1996). The Art of Warner Sallman. Yale University Press. p. 192. ISBN 9780300063424. Articles published in popular religious magazines during this time gathered together in an obviously didactic way several anecdotes concerning the power of Sallman's picture among nonwhites, non-Christians, and those exhibiting unacceptable behavior. We read of a white businessman, for instance, in a remote jungle, assaulted by a vicious group of headhunters who demand that he remove his clothes. In going though his billfold, they discover a small reproduction of Sallman's Christ, quickly apologize, then vanish "into the jungle without inflicting further harm." A second article relates the story of the thief who aborted his misdeed when he saw the Head of Christ on a living room wall. Another tells of the conversion of a Jewish woman on her deathbed, when a hospital chaplain shows her Sallman's picture. ↑ Lippy, Charles H. (1 January 1994). Being Religious, American Style: A History of Popular Religiosity in the United States. Greenwood Publishing Group. p. 185. ISBN 9780313278952. Retrieved 30 April 2014. Of these one stands out as having deeply impressed itself of the American religious consciousness: the "Head of Christ" by artist Warner Sallman (1892-1968). Originally sketched in charcoal as a cover illustration for the Covenant Companion, the magazine of the Swedish Evangelical Mission Covenant of America denomination, and based on an image of Jesus in a painting by the French artist Leon Augustin Lhermitte, Sallman's "Head of Christ" was painted in 1940. In half a century, it had been produced more than five hundred million times in formats ranging from large-scale copies for use in churches to wallet-sized ones that individuals could carry with them at all times. ↑ Blum, Edward J.; Harvey, Paul (21 September 2012). Color of Christ. UNC Press Books. p. 211. ISBN 9780807837375. Retrieved 30 April 2014. 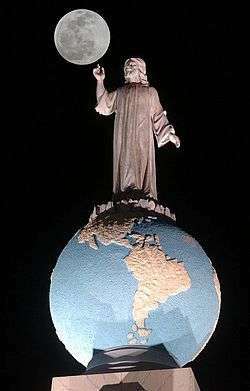 By the 1990s, Sallman's Head of Christ had been printed more than 500 million times and had achieved global iconic status. 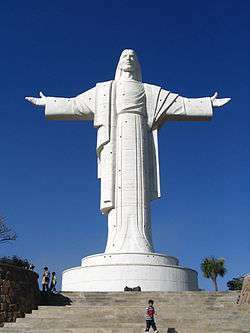 ↑ "Construction progressing on new Jesus statue along I-75". WCPO. 15 June 2012. Retrieved 7 September 2012. Hellemo, Geir. Adventus Domini: eschatological thought in 4th-century apses and catecheses. BRILL; 1989. ISBN 90-04-08836-9 ISBN 978-90-04-08836-8. Wikimedia Commons has media related to Depictions of Jesus Christ.